ServSafe Food Handlers Managers Certification Class for those interested in obtaining a Food Handler Managers Certfication. Tuesday March 05, 2019 from 9:00 am - 5:00 pm. This is a one day complete solution that will deliver food safety training and assessment for food handlers. Directly following class at 5:00 pm take the exam and walk away with your certification. The cost of the class is $165.00 per person, that includes materials, instruction, and exam. A $100 in advance is require for the materials. CHECKS OR MONEY ORDERS ACCEPTED, PAYABLE TO DCW. Join us for our ServSafe Food Handlers Managers Certification Class for those interested in obtaining a Food Handlers Managers Certification! Thursday, September 27 from 9:00 AM to 5:00 PM, participate in this ServSafe Food Handlers Managers Certification Class as a 1-Day complete solution that will deliver food safety training and assessment for food handlers. Directly following the class at 5:00 PM, take the exam and walk away with your certification! The cost is $165.00 per person and includes materials, instruction, and exam. Register by walk-in or by phone at 219.979.8156. 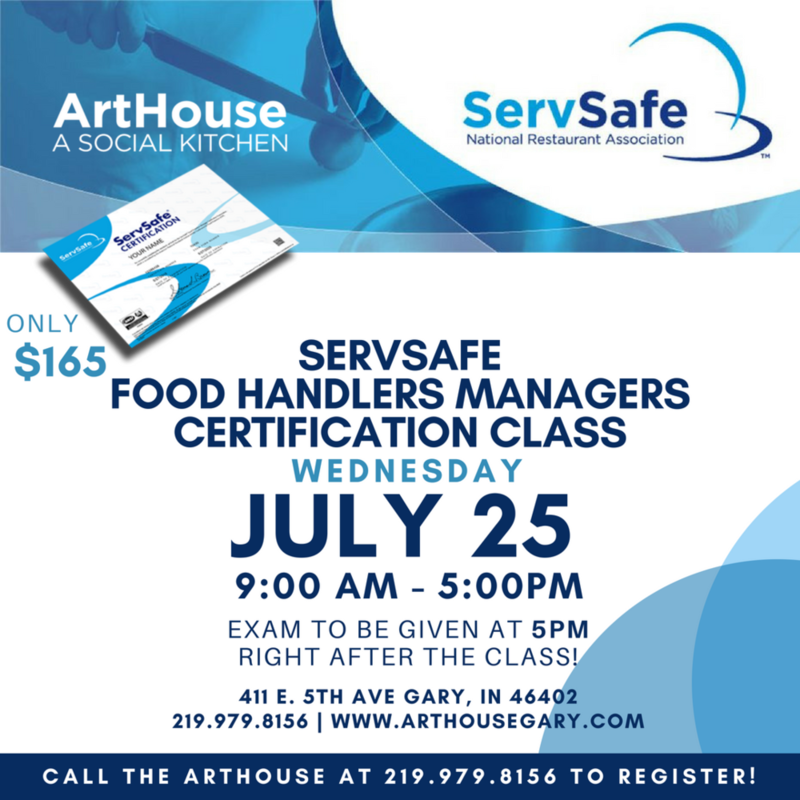 ArtHouse: A Social Kitchen Inc.
Join us for our ServSafe Food Handlers Managers Certification Class for those interested in obtaining a Food Handlers Managers Certification! Friday, August 24 from 9:00 AM to 5:00 PM, participate in this ServSafe Food Handlers Managers Certification Class as a 1-Day complete solution that will deliver food safety training and assessment for food handlers. Directly following the class at 5:00 PM, take the exam and walk away with your certification! PAYMENTS DUE BY 8/25. CHECKS OR MONEY ORDERS ACCEPTED, PAYABLE TO DCW. Join Larry Odell Dillon Tuesday, August 14 from 11:00 AM to 2:00 PM at the ArtHouse! Come out and view his inspiring pastel artwork on display, accompanied by a southern cuisine meal prepared by our chefs and available for purchase! $10 Lunch Special! - Includes roasted chicken, mashed potatoes, french string beans, roll, peach cobbler and a drink. Join us for our ServSafe Food Handlers Managers Certification Class for those interested in obtaining a Food Handlers Managers Certification! Wednesday, July 25 from 9:00 AM to 5:00 PM, participate in this ServSafe Food Handlers Managers Certification Class as a 1-Day complete solution that will deliver food safety training and assessment for food handlers. Directly following the class at 5:00 PM, take the exam and walk away with your certification! Please Note: All major credit cards, cash, check or money order will be accepted. The Gary International Black Film Festival and Chicago's Black Cinema House come together in partnership with Stanley Nelson’s film Tell Them We Are Rising at ArtHouse: A Social Kitchen! Thursday, June 28th 7-9PM join us for motion picture art and culinary adventure as we bring this powerful film to the center stage in our monthly Food & Film series. Each month come savor independent films paired with complimentary small tastings and refreshments from Arthouse: A Social Kitchen's emerging chefs. The story of Black Colleges and Universities (HBCUs) began before the Civil War and influenced the course of our nation yet remains one of America’s most important untold stories. A haven for Black intellectuals, artists and revolutionaries—and path of promise toward the American dream—Black colleges and universities have educated the architects of freedom movements and cultivated leaders in every field. They have been unapologetically Black for more than 150 years. For the first time ever, their story is told. FREE ADMISSION | DONATIONS ACCEPTED. Doors open at 6PM. Join us as Gary Health Department Inspector, Mr. Dejuan Owens facilitates a ServSafe Food Handler Manager Class for those interested in obtaining a Food Handler Manager Certification. Monday, June 25 from 9:00 AM to 5:00 PM, participate in this ServSafe Food Handler Class as a 1-Day complete solution that will deliver food safety training and assessment for food handlers. Directly following the class at 5:00 PM, take the exam and walk away with your certification! Please Note: It is FREE to RSVP for this class. All participants will pay at door. All major credit cards, cash, check or money order will be accepted at that time. Space is limited. RSVP is required. ArtHouse | Fun with Fruits & Vegetables! ft. Mama How You Cook This? Fun with Fruits & Vegetables! ft. Mama How You Cook This? Come have some fun with fruits and vegetables Tuesday, June 19th from 6-7PM at the ArtHouse! This session will provide you with ideas for quick and easy summer snacks and salads that all ages will enjoy. Together we will explore what fruits are great on the grill and create a veggie slaw that will compliment any entre’. Early arrival is highly recommended! As a mother of 4, and the eldest sibling of 6, Mrs. D has over 40 years of cooking experience. Through her years in the kitchen, she has learned how to balance life, career, and family in order to prepare quick, easy and tasty meals that anyone can follow. She brings value back to the kitchen by demonstrating, igniting, and directing food enthusiasts how to prepare quick, easy and tasty meals for active on-the-go family oriented individuals particularly millennials who are entrepreneurs, corporate employees, and newly married. Preparing meals for yourself or your family can be a bit intimidating, but it is my mission to confirm anyone can do this! As your #1 Kitchen Stylist, I will guide you through cooking successful meals with 5 simple, easy steps. So easy, you’ll no longer have to call upon mom to ask: "Mama How You Cook This?" ArtHouse | Quick Summer Bites – Kids Editions! ft. Mama How You Cook This? Quick Summer Bites – Kids Editions! ft. Mama How You Cook This? What to do with these extra hot dog buns? Summer is here and there will be lots of Bar-B-Q’s, picnics and leftover hot dog buns. Join us for some quick summer recipes to utilize what’s left – kids edition! Bring the kids Tuesday, June 12th from 6-7PM at the ArtHouse as Mrs. D shows you how to make quick & easy pizza and bread pudding that you and the kids will enjoy in this fun hands-on experience! The cost of this course is $175.00 includes all coursework material and your own license of the Business Plan Pro Software. Classes are every Saturday, June 2, 9, 16 and 23 from 8AM to 11AM at the ArtHouse: A Social Kitchen | 411 E 5th Ave, Gary, IN 46402. Checks and cash are also accepted, please stop by the ArtHouse to register or call the ArtHouse at 219.979.8156 to get signed up. For questions regarding this course, please contact us at arthouse@arthousegary.com. Scott Williams has over 30 years of experience teaching small business courses and working with start-up and existing entrepreneurs. Scott joined the ArtHouse in February 2018 to bring his entrepreneurial teaching capabilities to the area. He has taught small business classes in 18 States. The majority of his students are members of the Institute for Career Development that is associated with the United Steelworkers. Scott looks forward to working with the business community and start-up entrepreneurs. The Gary International Black Film Festival and Chicago's Black Cinema House come together in partnership with Anna Rose Holmer's surreal film THE FITS and a special performance by the Michigan City Soul Steppers Drill Team Inc. at ArtHouse: A Social Kitchen! Thursday, May 24th 6-8PM join us for motion picture art and culinary adventure as we bring this powerful film to the center stage in our monthly Food & Film series. Each month come savor independent films paired with complimentary small tastings and refreshments from Arthouse: A Social Kitchen's emerging chefs. ArtHouse | Food is Medicine - Part 1 with Chef Shay! Food is Medicine - Part 1 with Chef Shay! Learn how to eat clean during the busy work week by meal prepping healthy meals. All participants will be given a complimentary meal plan and tips as takeaways! Chef Shay will demonstrate quick meal preps for breakfast, lunch, dinner, and snack options for one day. She will also teach the participants how to package and store items for a week's worth of delicious and healthy meals! RSVP is required and you must bring a ticket. Chef Shannon "Shay" Smith began NJOY Eats & Prep in 2014 to cultivate a nutritional culinary experience in the lives of her clients. She is an advocate for mental wellness as it relates to maintaining a healthy lifestyle. She believes in living in your JOY, accomplishing your goals and highlighting the beauty and strengths of your personal journey. A lover of great food and fitness, Chef Shay encourages her clients to embrace an active lifestyle of physical fitness to compliment nutritional goals. Being fit can be fun and an amazing journey. Chef Shay is here to support each client through the experience. Connect with her at www.njoyeatsprep.com and @justnjoy25. The Gary International Black Film Festival and Chicago's Black Cinema House come together in partnership with Ava DuVernay’s ARRAY to present LGBTQ Disco Documentary Jewel’s Catch One Screening at ArtHouse: A Social Kitchen! Thursday, April 26th 6-8PM join us for critical conversation and culinary adventure as we bring powerful films to the center stage in our monthly film series. Each month come savor provocative independent films paired with complimentary small tastings and refreshments from Arthouse: A Social Kitchen's emerging chefs. This event is FREE. Doors open at 6PM. ArtHouse: A Social Kitchen is proud to announce Project Onward will be bringing their latest exhibit, ‘Honoring Legendary African American Artists: Distinct Portraiture by disAbled Artists’, to the ArtHouse! Open for display now until Saturday, May 5th, 2018 | 9AM to 5PM, Mon-Fri at the ArtHouse: A Social Kitchen located at 411 E. 5th. Avenue in Gary, IN. View works of art by Project Onward artists as they honor African American painters, sculptors, and installation artists through captivating portraitures. The exhibit is supported by a $10,000 grant from the National Endowment for the Arts (NEA). Eighteen pieces are newly created by Project Onward’s artists highlighting portraits of celebrated painters, sculptors, and printmakers, rendered by Project Onward’s master artists. Subjects include, among others, Jean-Michel Basquiat, Wangechi Mutu, Kerry James Marshall and Elizabeth Catlett. PORTRAITS was given its world premiere in February 2018 in conjunction with Black History Month. All works are created by Project Onward’s mentally and developmentally challenged artists. All proceeds benefit their studio and gallery. Project Onward is an independent 501(c)(3) nonprofit organization studio and gallery for professional artists with mental and developmental disabilities. This organization supports the professional development of artists with exceptional talents and challenges, ranging from autism to mental illness, and provides these artists with workspace, materials, professional guidance, exhibition opportunities and access to markets to sell their work and advance their careers. Project Onward’s studio and gallery are FREE and open to the public Tuesday-Saturday, 11am-5pm, and on the 3rd Friday of each month until 9PM. In opening the studio and gallery to the public and activating the space with free public programs, Project Onward seeks to promote art as a powerful tool for understanding and valuing the real and potential contributions of our national population with disabilities. At Project Onward, art has become a unique medium for comprehensively and constructively discussing mental illness and developmental disabilities and re-framing the discussion around these artists’ abilities. Housed on the Bridgeport Art Center’s 4th Floor, Project Onward presents group and solo exhibitions in three galleries: the Main Gallery, the Spotlight Gallery and Gallery B. These professionally curated spaces host regularly rotating exhibitions that feature art by Project Onward’s member artists. The gallery celebrates new openings monthly and invites collectors, supporters and the public to enjoy drinks and refreshment, explore the exhibitions and also engage with Project Onward artists while they work in the studio. To learn more about Project Onward, please contact: info@projectonward.org. ArtHouse | Meal Prep Like A Boss with Chef Shay! MEAL PREP LIKE A BOSS! with Chef Shay! ArtHouse: A Social Kitchen is proud to announce our new Executive Chef, Lamar Moore! On Saturday, April 14th, 2018 from 6PM to 9PM at the ArtHouse: A Social Kitchen located at 411 E. 5th. Avenue in Gary, IN, join us as we welcome our new internationally known Executive Chef and culinary expert, Lamar Moore! The entire community is invited to this FREE event as we introduce him to the City of Gary and surrounding areas. There will be a live DJ, food and a chance to meet the chef himself! We are anticipating much participation and attendance from the NWI community and Chicago land area, RSVP is required and you must bring a ticket. Chef Lamar Moore was born in Chicago, Illinois but his skill in the culinary arts field has taken him to Europe, Greece and throughout the US. With a degree in Culinary Arts from Cordon Bleu in Chicago and 15 plus years in the field, Moore has already established himself as a top chef in the Chicagoland area. Moore has been featured in Zagat.com, Plateonline.com, Food Network and Post-Tribune, just to name a few. Chef Moore brings his talents to the ArtHouse as our head chef and culinary expert. We are excited for this new partnership and look forward to the wealth of knowledge Moore will bring to the City of Gary. himself uses video in his own marketing campaigns. Z has been in the video business for over 20 years and has been officially running his own independent video production company for the last 6 years. Darque Syde of D'Lyte Productions specializes in short marketing content for entrepreneurs and start-ups but has also begun to amass a considerable corporate clientele. Join us Thursday, April 5, from 6-8PM for a delicious medley of conversation, cuisine, and an announcement of our exciting new developments in the Emerson neighborhood. Gather with us as we introduce our new public art project, ArtHouse Patio. The side lot has been renovated into a new outdoor gathering space. Be among the first to see the new art installation and patio design on May 3, 2018 for our Public Opening. Bites will be prepared by our Executive Chef, Lamar Moore! Please Note: This event is FREE and open to the public. RSVP is strongly encouraged but is not required. Arthouse | Senior Day ft. Live Musical Guest Art Hoyle & Jazz Band! Senior Day ft. Art Hoyle & Jazz Band! Seniors, please join us for an afternoon of live music, fine cuisine and socializing at our official Senior Day event. Enjoy a live musical set by our special guest performer Art Hoyle & Jazz Band followed by a splendid lunch prepared by our Executive Chef, Lamar Moore that will be available for purchase for $8. The Senior Special includes smothered chicken, mashed potatoes, and candied carrots, followed by a delicious dessert of cheesecake with strawberry sauce. Please Note: This event is free and open to all senior citizens of the public. RSVP and early arrival is strongly encouraged. Arthouse | Culinary Business Incubator Agile Kitchen Challenge! Join us as our current Culinary Business Incubator (CBI) Training Program students face off in an ultimate food challenge! Two teams will prepare the menu, purchase the ingredients, cook the food and serve to 30 invited guests! In addition, the ArtHouse: A Social Kitchen is extending an opportunity for the public to watch the Agile Kitchen Challenge too! RSVP to reserve your spot today. Please Note: This event is free and open to the public. RSVP and early arrival is strongly encouraged. In this Secrets to the Glam makeup demo ladies will learn an everyday makeup look that can go from day to evening by simply adding a few beauty secrets by makeup artist Asiann Jackson of Bella Artistry 123. RSVP and early arrival is highly suggested! Please Note: This event is free and open to the public. RSVP is strongly encouraged. Special free events are hosted weekly at ArtHouse to compliment the business and training activity in the facility. Culinary + Art Exploration events are facilitated by local and regional experts and are free/open to the public. Events are appropriate for novice to expert: growers, food hobbyists, enthusiasts, culinary entrepreneurs, butchers, caterers, bakers, food vendors, chefs, and restaurateurs. No experience is necessary to participate in Culinary + Art Exploration events. Have questions about this event? Visit the Arthouse: A Kitchen Social site! Learn how to raise monarchs! Seating is limited to 20 individuals. Children ages 10 and older welcome. Special free events are hosted weekly at ArtHouse to compliment the business and training activity in the facility. Culinary + Art Exploration events are facilitated by local and regional experts, and are free and open to the public. Events are appropriate for novice to expert: growers, food hobbyists, enthusiasts, culinary entrepreneurs, butchers, caterers, bakers, food vendors, chefs and restaurateurs. No experience is necessary to participate in Culinary + Art Exploration events. ZUMBA FITNESS, a Latin-inspired dance fitness workout program! This class is a mix of low-intensity and high-intensity moves for an interval style, calorie burning, dance fitness party. It’s a total workout, combining all elements of fitness – cardio, muscle conditioning, balance, flexibility, boosted energy and more! This event is free, and open to public. RSVP is strongly encouraged! Learn more about her at www.nicolewoods.zumba.com. Celebrate the brilliance of Black women as GIBFF, ArtHouse: A Social Kitchen and Chicago's Black Cinema House bring powerful stories directed by independent women filmmakers to the screen. Featuring the works of Ireashia Monet (Ebb & Flow, Reimagining Blackness and Ancestry) and Stephanie Jeter (Searching for Isabelle), their dynamic creative talents of provocative visual styles explore a range of ideas. Both filmmakers will be in attendance. The night's culinary pairing features Chef Lamar J Moore's (Currency Exchange) tribute to women, with recipes inspired by chef Edna Lewis. This event is FREE. Doors at 6PM. RSVP STRONGLY ENCOURAGED. Post-screening discussion and delightful culinary bites to compliment the film's theme will follow.